There’s usually two camps in the motorcycle world as far as safety goes – those who gear up and those who purposefully don’t wear protective gear for the experience of feeling more free when they ride. Call it vainglory or ignorant, but this free-rider fashion statement does very little for people’s safety. Those who don’t wear helmets while motorcycle riding say it’s their personal freedom to choose between wearing a helmet and not wearing one. Even Bechtold admits he’d probably be safer if he wore a helmet. Only those riders 17 years and younger are required by state law to wear helmets. There are only 19 states and the District of Columbia that have laws requiring motorcyclists to wear helmets. Illinois, Iowa and New Hampshire all require motorcyclists ride with helmets on. The leading cause of death for motorcyclists is head injury. In 2014, nearly two-thirds of the motorcyclists killed in Colorado were not wearing a helmet. In 2015, an all-time high of 105 people died in motorcycle crashes. That’s nearly a 12 percent rise over 2014 and 20 percent more than in 2013. 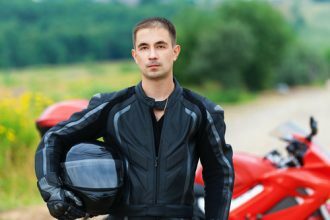 Helmets and even leather gloves and jackets can make a significant difference for motorcycle riders, according to the Insurance Institute for Highway Safety (IIHS). If you’ve been injured in an motorcycle accident, it’s time to contact a trusted Littleton Motorcycle Accident Attorney at Bahr, Kreidle & Flicker. Since 1983, our attorneys have been fighting on behalf of motorcyclists and aggressively standing up for their justice. Our lawyers know how serious and devastating the impacts of a motorcycle accident can be, and we know that many injured people depend on settlements to get the medical treatments they required. That’s why we are committed to advocating injured motorcyclists’ rights while working diligently to help them maximize their financial recoveries. Call for a free, introductory appointment today at (303) 562-1507 or email us using the contact form on this page. 1“Freedom, safety steer helmet debate” published in Littleton Independent, July 2016. 2“Everything You Ever Wanted to Know About Motorcycle Safety Gear” published in Indefinitely Wild, July 2014.